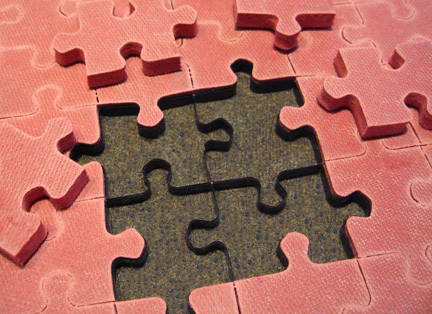 When I was a TA in graduate school, I led a professor’s students in an activity that reminded me of a jigsaw puzzle. A 12th-century setting of the Christmas Mass gradual, “Viderunt Omnes,” by Leonin of the Notre Dame School of polyphony was snipped into multiple strips of paper in a sealed envelope. Student teams were responsible for sequencing the polyphonic setting of the traditional chant from its disorder. In order to successfully recreate the complete setting, students had to fully understand the relationship of Leonin’s compositional choices to the structure and style of the original chant setting. Instead of passively observing Leonin’s elaborated version, students had to piece it together from random fragments. Perhaps students could learn formal structures of large-scale works better through puzzles than models. James M. Lang posted an interesting piece in the Chronicle of Higher Education on the “Benefits of Making it Harder to Learn” and I wonder if we are short-changing students by providing them with the paradigm schema for easy, yet shallow understanding of complex texts. According to Lang, providing challenging learning conditions for students results in deeper encoding, and thus better recall. Although the tests of “cognitive disfluency” cited in the article center on challenging fonts of text, Lang cited some strategies he shared at the Institute for Pedagogy in the Liberal Arts that may prove engaging for classroom activities. The first technique, asking students to process or translate course material using unusual rhetorical or expressive modes, reminded me of the assignment on Leonin’s polyphony, a visual expression of a text for students to process through puzzle solving strategies. An updated version of this assignment pushes cognitive disfluency further. Instead of having students sequence Leonin’s elaboration through comparison to the original Christmas Mass gradual, I will ask students to work with fragmented excerpts from both versions. This will require an additional layer of difficulty so that students will move beyond just understanding the relationship to discovering that the texts are related in the first place. The following chart illustrates a simplified sequencing of both versions. In working with fragments of both versions together, students will gradually (pardon the pun) discover that there are two fragments for each bit of text, some of which have identical musical settings and others that are different. This will trigger the observation that there are two versions of the same text that are related. What follows is the goals of the original assignment as developed by the professor when I was a TA, figuring out that Leonin has only updated the solo sections of the chant and that he writes organum for syllabic phrases and discant for word melismas. I have provided models for most of the musical forms I teach (sonata form, da capo aria, etc.) for students in the past before we observe complete texts, although many students have difficulty processing form when individual musical pieces betray the paradigm. Perhaps puzzles will yield a deeper understanding of formal structures and help students accept that models are the descriptive product of theorists and not the prescriptive framework for composers.